Hi that plant is not an evergreen. How long has it been above ground? I don't know what's happening to your Dracunculus. I do have a question for you. What zone do you live in? Dracunculus are perfectly hardy outside (in the ground) here in Canby, OR zone 7B. Mine have survived near zero winters a couple of times and the inflorescence on one was 20" long and over 12" wide!! Quite spectacular (an opinion not necessarily shared by my downwind neighbor!). I usually mulch mine with a few inches of leaves if the weather gets really cold. > Hi that plant is not an evergreen. How long has it been above ground? > Blockbuster Total Access, No Cost. Sheldon, I am a zone 5, that's why I grew it in a pot inside. Thanks. > perfectly hardy outside (in the ground) here in Canby, OR zone 7B. > weather gets really cold. Could be fertilizer burn. Or bugs. Is the plant grown indoors? Do you see anything on the underside of the leaf? You dream job is up for grabs. Grab it. looks as if the plant is dying slowly, the "stem" is now looking weary. > you see anything on the underside of the leaf? A previous responder may be right. It might just be going into dormancy. If it dies down, check the corm. It may be fine. If not, I'll be happy to send you one of mine. Well I only fertilized with a small amount..... And def not bugs! I (unfortunately) know and seen the effects of all different types of bugs... I've worked several greenhouses in the last 10 years.... It looks as if the plant is dying slowly, the "stem" is now looking weary. It probably is dying. They just don't like living indoors, from my experience. 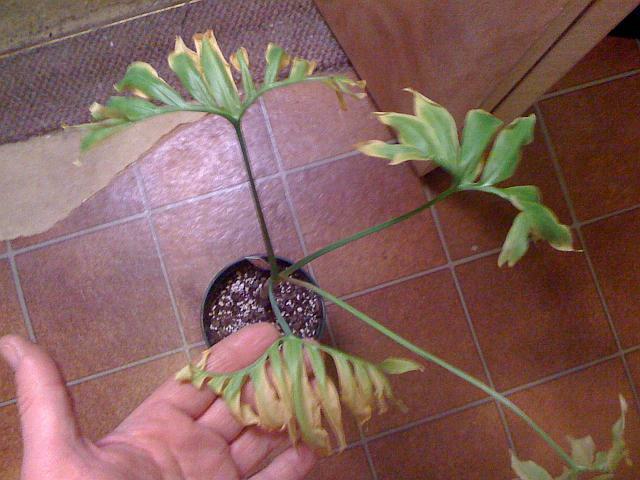 Thom Powell wrote: Sheldon, I am a zone 5, that's why I grew it in a pot inside. Thanks. than the little guy can tolerate. ter/text5.com> month of Blockbuster Total Access, No Cost. I will plant it in my garden. > not, I'll be happy to send you one of mine. > Subject: Re: [Aroid-l] HELP!!!!!!!!!!! >> Could be fertilizer burn. Or bugs. Is the plant grown indoors? >> Do you see anything on the underside of the leaf? >> perfectly hardy outside (in the ground) here in Canby, OR zone 7B. >> weather gets really cold. >> Blockbuster Total Access, No Cost. on aphid infestations on my carnivorous Drosera capensis (Cape Sundew). There may be some plants somewhere that will not tolerate this, but as yet, I have not met them. If you cannot salvage yours, let me know. I can't send you one now because they're already up about a foot high and they don't like to be disturbed when growing, but when they go dormant this Fall, I can dig some up for you. Sheldon, I just checked the corm this morning.... It was there, BUT the top layer of "skin" came right off and there were clear, white thrip-like critters all over under there .... It even had 2 little corm coming. I threw it away, I didn't want to infest any of my other plants. I would be very happy to take you up on your offer, and let me buy one from you. Since I now know that they are hardy to zone 5 (NY) I will plant it in my garden.